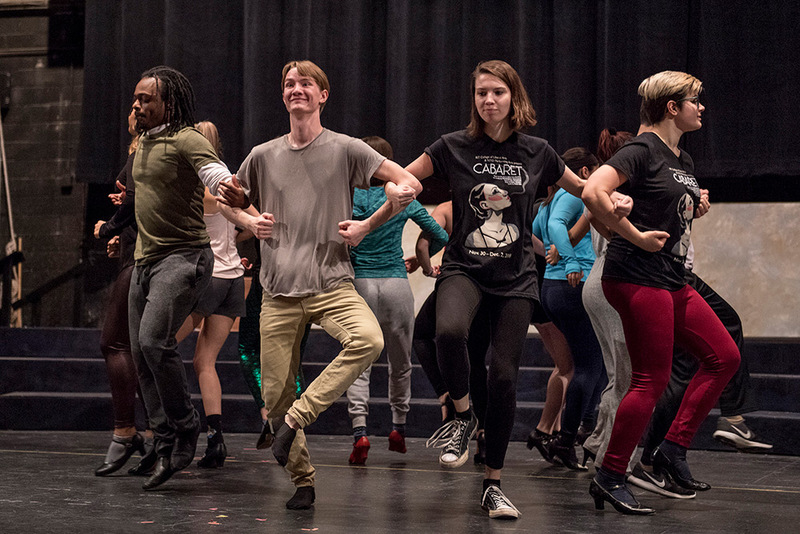 Rochester Institute of Technology students, from left to right, Kendell Charles, Liam Dougherty, Molly Parker and Lexa Frail rehearse for upcoming performances of <em>Cabaret</em>, Nov. 30-Dec. 2. The show brings together deaf, hard of hearing and hearing actors to create a unique experience for theater-goers. The show, directed by Andy Head, visiting assistant professor, welcomes theater-goers to the top-secret Kit Kat Klub, where the music is loud, the dances are flashy and the party rages on. The club’s newest headliner, Sally Bowles, meets American writer Cliff Bradshaw and their lives become entwined. But, as Nazism spreads throughout Germany, questions and concerns continue to grow about how the club, its patrons, and Sally and Cliff—played by Kyle Buohl, a third-year ASL-English interpretation major from Boston—will fare. The show is not appropriate for children under 12. Tickets can be purchased through RIT University Arenas and are $5 for students and senior citizens; $10 for RIT faculty/staff/alumni; and $12 for the general public. Tickets will also be sold at the door two hours before show time on performance days. American Sign Language interpreters will be available for all performances. For more information, call 585-475-4121.